Restricted Countries Bulgaria, Denmark, France, Spain, Israel, UK and United States. Experience the kind of betting action that sends shivers down your spine and encloses you with ‘positive energy’ granting you a higher chance of winning on any of the 31 betting markets. That’s what you can expect from Betfinal every time your place a wager on your favourite sport or event. Build on your war chest with the Welcome Bonus that can see you scoop an additional 200% up to €100. 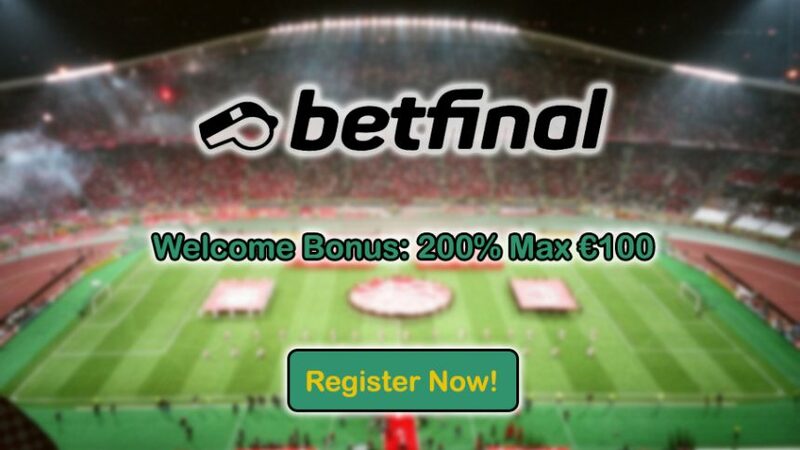 Comparing this Welcome Offer with that of other online sportsbook, this is an absurd amount as you normally get only a Free Bet, which only goes to show that Betfinal is betting site for the long-run. Besides the standard betting markets like Football, Tennis, Ice Hockey and Basketball, Betfinal features a wide range of special sports options that give niche opportunity. These markets include the likes of Darts, Aussie Rules, Surfing, Badminton, Virtual Sports and even eSports – bet on Counter-Strike: GO, Dota 2, League of Legends and other thrilling eSports events. In case you miss out on placing a wager on some sporting event, take advantage of Betfinal’s Live Betting option – this is where you can monetize on the all the action while it’s ongoing in actual time. Browse through to see which sports markets have the best odds at that moment to maximize your earnings. Insure your bets with one of the three promotions in case something unforeseen happens during your selected games: ‘0-0 Bore Draw,’‘90+ Money Back Special’ and the ‘ACCA Insurance.’ Make sure to use these offers as often as possible, as Betfinal doesn’t give out any other kind of promotions at this moment. Depositing funds to your Betfinal account shouldn’t be too hard, considering the biggest providers (Skrill, Visa and MatserCard) are all available for use. However, on the other hand further payment systems would be welcome in order to facilitate faster services for players. But in terms of currencies that you can bet with, there are no lack of options in this department, which is a great plus for the online sportsbook. Additionally, to complement the niche language selections, you can also bet with some niche currencies like Georgian Lari or even the Azerbaijani Manat, among others. The best way to reach the customer support is through live chat, in case you need some assistance through your betting adventure with Betfinal. You’ll receive effective solutions promptly from the support team, which is a great plus because this allows you to get back to betting almost instantly. The only downside with the customer service is that they’re open for a short period of time during the day, so make sure to catch them during working hours. Besides Betfinal Review, check out our other online sportsbook reviews to discover other popular online gambling destinations. Take a look at the detailed online betting guides and online sportsbook bonuses for winners! You can also follow the latest online sportsbook bonuses and online betting promotions on Twitter and Facebook.